Another example of a powerful digitally composited image. Long Island and NYC ad agencies take notice. Your art directors and creative people have a vision for the perfect images for your advertising or public relations campaigns. All too often, however, the client doesn’t have the budget for elaborate location shoots. That’s where I come in. By capturing the talent in my East Northport, NY studio (or at any other location of your choice) and shooting the location at another time or place; budgetary concerns can be addressed by using digital manipulation to create dynamic images. Often these images will be even better than those that might have been acquired in an elaborate location shoot as perfect conditions can be created to order in the digital darkroom. Some of my advertising and public relations clients have also used stock photography for background images, enabling them to place their models or executives in almost any conceivable venue. 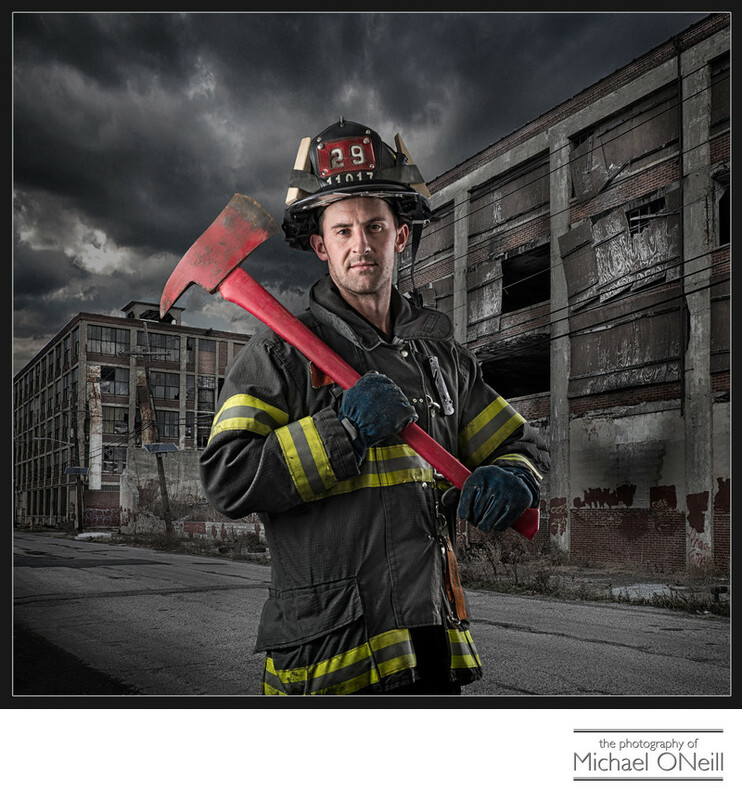 The image of the NYC firefighter here was created in my East Northport, New York studio. I photographed the background image of the abandoned buildings on another date in Camden, NJ. The final element...the clouds in the sky...was captured on yet another day. The three images were combined in a cost-effective manner to create a very dramatic finished composite image. Got an idea in your mind without the budget to make it a reality? Give me a call. I’d love to work through it with you.